Jumbo Empanadas: Sandwiches: What’s in a name? Sandwiches: What’s in a name? Some people are quite particular about what they’ll call a sandwich. I’m perhaps surprisingly not. If it’s got some sort of starch like substance enrobing some sort of filling and is handheld, that works for me. Under my very broad definition of a sandwich you’ll find subs, panini, wraps, shwarma, falafel, burritos and burgers, just to name a few. 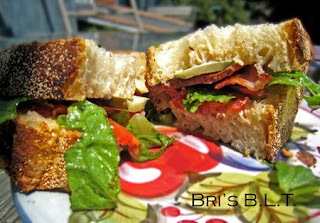 Some of these I make at home, (like my glorious BLT’s) and others I tend to look for when I’m out and about in Toronto. Burritos are popular lately and most people have a favourite burrito shop that they frequent exclusively. 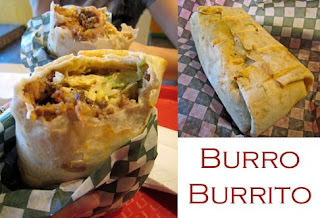 I have long been an advocate of Big Fat Burrito in Kensington Market, (and especially their pulled pork burrito, it’s awesome) but I’m also willing to try new places so when I was advised that Burro Burrito was the place to go, I had to make a trek there. One of the perks of Burro Burrito, (so I was told) was that they have both chicken and steak burritos but also give you the option of combining the two. I enjoyed my steak and chicken burrito but I won’t be returning there frequently enough that they know my order by heart like they do for some people. I’m sticking with Big Fat Burrito. Roti kind of looks like the Caribbean form of a burrito from the outside, but one bite will convince you that they’re completely different entities, (though both in the sandwich family as far as I’m concerned). Like burrito joints, there are many different places to get roti, each with a pact of devote followers that are certain their roti house is the best. I used to love a place called Jerk Spot. 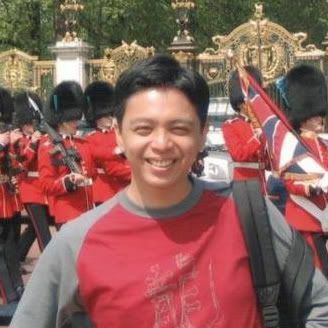 It was located in the Entertainment district and was my favourite place to go after the bar during my university days. There were two entrances to Jerk Spot, one at the front and the other at the back off a parking lot and alleyway that wasn’t really visible unless you knew it was there. I used to enter from the back as my favourite bar was on the other side of the parking lot and it was just a hop, skip and a jump away after last call. I usually got either the jerk chicken roti or curried chicken roti and couldn’t wait to get it into the parking lot to tear into it. Sadly, Jerk Spot has closed down and I haven’t yet found a place that I love as much. Part of me wonders if that’s at all possible because half the charm of Jerk Spot was that a trip there was usually preceded by a night of memories made with friends. In my quest to find a Jerk Spot substitute one of the places I’ve tried is Island Foods. 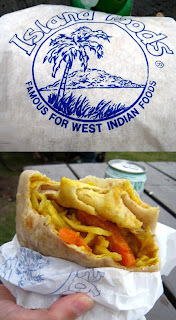 I have sampled their vegetable roti and although it was quite good and I will most likely return to try their jerk chicken, it can never replace Jerk Spot. I love discovering new places that have the potential to become favourites. When I see a new restaurant opening in my neighbourhood I look forward to trying it out. I watched as Wild Thing was renovated into a café and gelato bar as I passed by it a few times a week on my way to work. When it was finished it was neat, bright and inviting with a sandwich board outside the front door advertising their daily selection of paninis. The thought of a goat cheese, sundried tomato and roasted red pepper panini had my mouth watering so I knew it was only a matter of time before I gave it a shot. 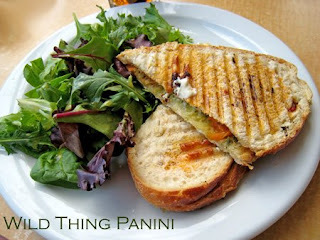 My panini, though on the skinny side, was quite good and certainly flavourful. It was served with a side of mixed greens that was unfortunately decidedly lacking in the dressing department. Aside from the sandwiches though, Wild Thing makes their own gelato and you know I’m a sucker for all things ice cream. They will certainly have my business again so long as they’re serving flavours like Pineapple and Basil, Mayan Chocolate and Ruby Red Grapefruit with Vodka. Upscale chefs are onboard the sandwich wagon too. Jamie Kennedy’s recently opened Gilead Café has a selection of sandwiches and lunch offerings that change regularly based on what’s available locally and in season. The Gilead Café is a very affordable way to experience Jamie Kennedy quality food at regular people prices. And even though the café is tucked away on a side street, word of mouth has spread quickly that it’s an awesome place to grab a bite. There isn’t a lot of room to eat in, so expect it to be busy right around lunch time but don’t let that deter you from going. Whereas most places will offer a side of salad with your sandwich, on the day I was there, Jamie Kennedy was offering sautéed asparagus. It’s touches like this that let you know this café is part of the J.K. family. Most importantly though, the sandwich I had was grilled halloumi and vegetables and it came with homemade ketchup for dipping which was fantastic. I’ve been itching to return there ever since. 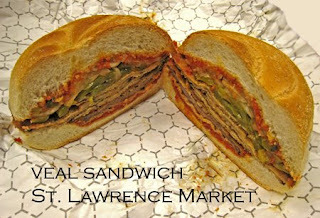 In general it’s rare that I order the same meal repeatedly when I frequent a restaurant but the veal sandwiches at the St. Lawrence Market make me break that rule. They’re perfect in every way and when a craving for one hits it’s impossible to get it out of my head. The sandwiches from Mustachio are also enormous so it’s best to bring a friend along to help you eat it. Imagine if you will, fresh foccacia bread piled high with thinly breaded parmesan veal cutlets, grilled eggplant, onions and peppers, slathered with tomato sauce. You want one now too, don’t you? If it’s dessert you’re craving, sandwiches don’t have to be savoury, I fully accept any sort of cookie or ice cream sandwich too. If you happen to be in Toronto near the end of August each year you should stop by the Canadian National Exhibition, (known also as “The Ex”) which is basically an enormous fall fair with rides, games, food, shows and entertainment. Of course I’m particularly interested in the fair foods like cotton candy, caramel apples and waffle ice cream sandwiches. 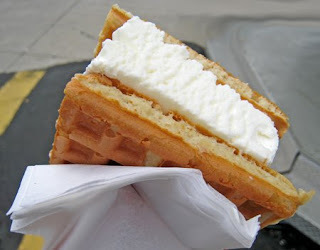 Since this is a sandwich post, it’s only right to highlight the waffle ice cream sandwich which features a slab of vanilla ice cream pressed between two hot off the press waffles. The smell alone will lure you in, but you’ll stay for the hot and cold contrast between the ice cream and the waffles. My waffle maker is currently out of service but that didn’t stop me from making an ice cream sandwich with the NY Times 36 hour chocolate chip cookies and some homemade coffee flavoured frozen yogurt. You can pair just about any cookie with any flavour of ice cream, if it sounds good to you, go for it. 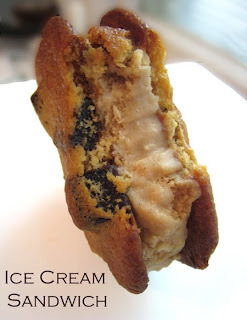 I think my recent bacon ice cream would be pretty good with chocolate chip cookies too. Mmmm salty and sweet. Other sandwiches coming out of my kitchen include things like simple egg salad on freshly made bread, or one of my personal favourites, the B.L.T., (particularly if it contains homemade bacon and bread and lettuce and tomato from the garden). I urge you to branch out from your typical sandwich eating habits, especially if that means a diet of subs from the same sub shop that you always go to. Try a falafel or roti next time the sandwich craving hits. Even if you don’t love it, at least you tried something new and I've given you something. 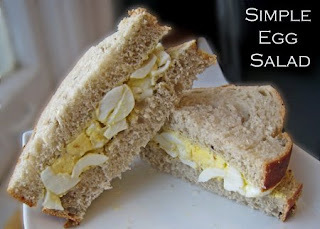 The egg salad sandwich, B.L.T. and chocolate chip cookie ice cream sandwiches came from my kitchen and you’re welcome to stop by there too. Posted by Brilynn at 11:41 p.m. When you mention Jamie Kennedy, I think of the comedian. Oops! Ha ha ha. I think the bacon ice cream *would* go very well with the chocolate chip cookies! Yum! A very informative post. I don't know if your roti is the same as what we have here in Malaysia but it does go down a treat with curried anything. What a great post! Very informative and full of carbs love! 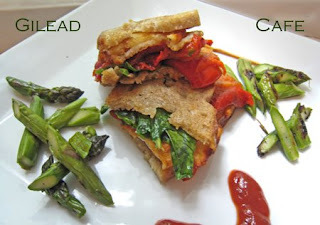 For me a sandwich is made with fresh bread, expection made to cookie sandwiches! I'll take one of the all!! Look at all of that tasty food. I really should get out and try more restaurants in Toronto. Nice celebration of the sandwich! I, too, am a lover of this foodstuff. Wow - I would definitely love to go sandwich-ing in Toronto! Especially for the roti...I wish we had more places to get Caribbean food here in San Diego. There's a great roti place in Boston, and while I don't know if roti qualifies as a sandwich, it surely is on my list of favorite "hand pies". All of the sandwiches you wrote about sound and look delicious. All of those sandwiches... very creative flavor combos! And your desserts... they always take the cake, Brilynn! I'm a sandwich fan, and every single one of these looks amazing!